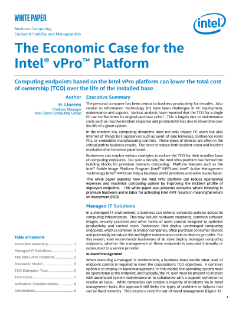 Learn more about the total cost of ownership (TCO) for computing endpoints based on the Intel® vPro™ platform. This white paper focuses on the manageability and stability features of the Intel® vPro™ platform and how they impact the lifetime incident profile across an installed base of computers. An economic model is presented that incorporates hardware, deployment, and maintenance costs used to ...compare TCO versus non-vPro branded deployments.